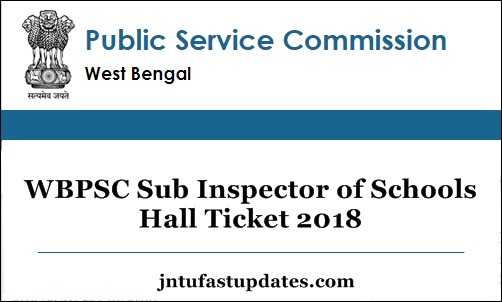 WBPSC Sub Inspector of Schools Admit Card 2018: West bengal SI of Schools examination is going to held on 7th October by West Bengal Public Service Commission (WBPSC). Aspirants applied for the WBPSC SI posts will have to appear for the written test as per the scheduled dates. Candidates have to download WBPSC Sub Inspector of Schools admit card to give the examination. Hence competitors can visit the WBPSC official portal, pscwbonline.gov.in to download the admit card/hall ticket. Candidates will not be permitted to attend the test if they do not show the admit card at the time of examination. Hence all the hopefuls are instructed to carry the admit cards as a must. Download and keep the admit cards safe to carry it to the examination hall. Along with the hall ticket, candidates have to promptly carry any of the identity proof such as PAN Card/Aadhar Card/Driving Licence/Vote card or any other copy. Examination officers are going to verify the identity proof and hall ticket of the candidates. So it is mandatory to carry these documents while going to the examination. Aspirants can go through the further details such as examination guidelines, hall ticket release date, and others from this article. West Bengal Public Service Commission (WBPSC) is the state level government authority that issues various recruitment notifications every year to hire the suitable aspirants for various Government-affiliated organizations. This year the WBPSC has hosted the Sub Inspector of Schools notification for 338 posts. Candidates having the suitable eligibility standards have applied from 17th July to 6th August. WBPSC has received a large number of applications from the eligible and interested aspirants. The selection process will be based on written test and interview rounds. The WBPSC is going to organize the written test shortly. All the applicants have to attend for the written test round initially. In order to attend the written test round, candidates have to download WBPSC Sub-Inspector of Schools admit card. It will be accessible to download at pscwbonline.gov.in shortly. Probably, the admit card/hall ticket will be released before 10 days of the examination. Candidates should remember this and keep checking the WBPSC official website for latest updates. Applicants can get the WB SI of Schools Admit card shortly from the official portal, pscwbonline.gov.in. The organization will release the admit cards before 10 days of the examination (approximately). Candidates can check the details of examination center, date, timings from the hall ticket. Also, the details of the candidate’s name, date of birth, signature, photograph and other information will be printed on admit cards. So, after downloading check all the details carefully. If any spelling corrections are there, contact the WBPSC authorities through phone, email, etc sources for necessary corrections. Go through the following steps to download West Bengal PSC SI of schools hall ticket. Search the WBPSC Sub-Inspector of Schools Hall Ticket download link in organization website. Check the information in WBPSC SI of schools’ hall ticket.